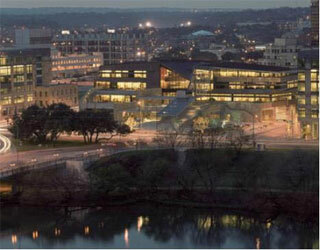 Profile: Austin City Hall is a unique landmark gateway to Austin city government. One of the design goals was to use technology to increase effectiveness and participation in government business. The Council Chambers are equipped and lighted as a studio for broadcast television. The Chambers are also equipped with computers and technology for multimedia presentations. In addition the facility achieved a LEED Gold certification from the USGBC. Services: DataCom Design Group provided the IT infrastructure design to support a high-speed network, wireless data network, audiovisual systems, and teleconferencing. DataCom's security experts developed the security standards and coordinated the design of the systems which were required to provide appropriate control and monitoring capabilities while maintaining a welcoming and open environment to the citizens of Austin.